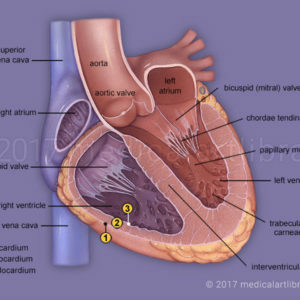 The superior vena cava and inferior vena cava (not shown) bring deoxygenated blood from the body into the right atrium, from which it enters the right ventricle. Blood leaves the right ventricle via the pulmonary trunk. The pulmonary trunk delivers deoxygenated blood to the lungs. It splits into the right and left pulmonary arteries which go to the right and left lung. 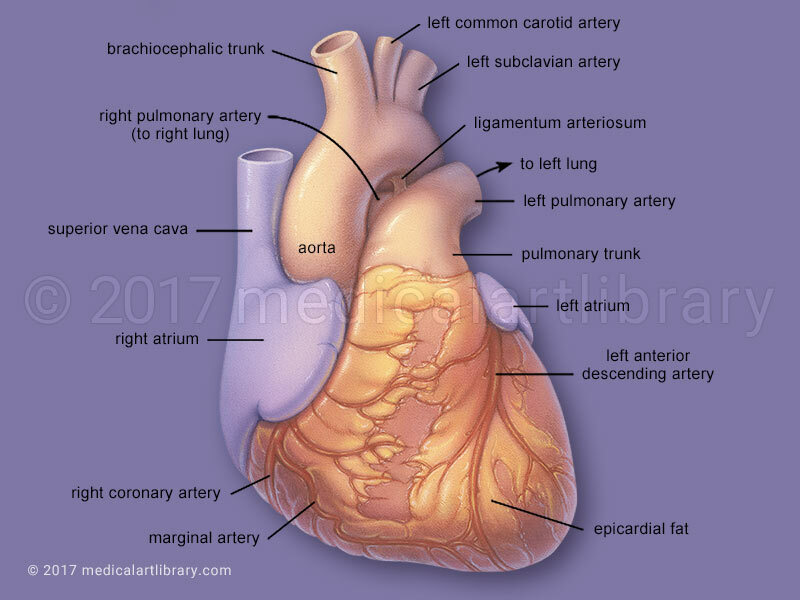 Oxygenated blood from the lungs re-enters the heart via the pulmonary veins (not shown) on the posterior aspect of the left atrium. 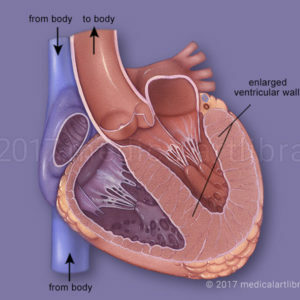 From here it enters the left ventricle and is delivered to the body via the aorta. 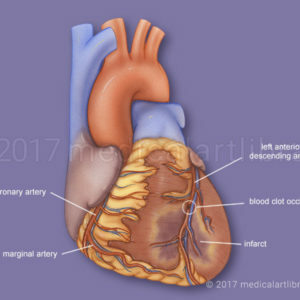 The right and left coronary arteries arise from the base of the aorta and are embedded in the epicardial fat on the surface of the heart. Branches shown are the right coronary artery, marginal artery (right) and left anterior descending arterty (left). The left anterior descending artery lies in the anterior interventricular sulcus, which separates the left and right ventricles. The aortic branches shown are the left common carotid artery to the head and neck, the left subclavian artery, to the left arm and body wall. The brachiocephalic trunk divides into the right carotid and subclavian arteries. The ligamentum arteriosum is the fibrous remnant of the ductus arteriosus which allows blood to bypass the lungs in the developing fetus. The ductus closes at birth normally within two weeks.